Gloria Martha Ramirez, 74, passed in her home on Sunday, February 3, 2019. She was born March 21, 1944 in Villaldama Nuevo Leon, Mexico. Gloria has been a resident of Pearland for 55 years, she worked for Pearland ISD as an aid for life skills and was a member of the Red Hats Society. 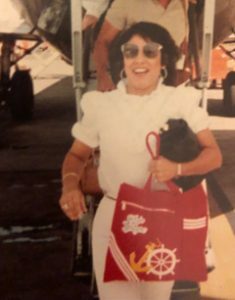 Gloria is preceded in death by her grandson, Roland Villarreal Jr; parents: Vicente and Santos Gloria Ramirez; sister: Virginia Ramirez Reyes; brother: Roberto Arizmendi; niece Santos Gloria Cuellar; nephews Alexander Gamez and Ramon Gamez, friends Lucy Bishop and Virginia Corpus. Gloria leaves behind her daughter, Diane Hernandez Castro, husband Kenneth; grandchildren: Roland Villarreal III, partner Timothy Hampson, Ryan Neal Villarreal, wife Ashley Smith villarreal, David Michael Navarro, fiance Taylor Newquist and Kaylee Danielle Castro; great grandchildren: Ava Marie Villarreal and Aiden Dwayne Michael Navarro; sisters: Elidia Gamez, husband David, Maria Ramirez, Yolanda Ramirez (Alex Ortiz) and Ida Ramirez; brother-in-law, Manuel Reyes, Jr. and sister-in-law,Betty Ann Arizmendi; best friends: Sharon Hernandez, Bettie Wright as well as many other family and friends. In lieu of flowers please make memorial contributions to: Hospice Care Team, 11441 32nd Ave No St B. Texas City, TX 77591. My condolences from Rene Hernandez Family in Dallas Texas. Sending hugs and love your way. May God comfort us all in the loss of Gloria’s life on this earth. She was a wonderful help, mentor, friend,and more for these many years. I look forward to celebrating with her in heaven. Sending prayers to you and your family Diane. I also want to express my condolences to my mother Elidia and my aunt’s Maria, Yolanda, and Ida. With all my love and prayers. My sincerest condolences to the family during this time. Praying for you all. To know her was to love her. I enjoyed the short amount of time I got to serve with and got to know. May God give you peace and surround you in His arms during this time and always. My most sincere condolences on the parting of my dearest friend, Gloria, to her eternal home, heaven. I cannot believe she is gone from us. We did not visit in person much lately, because I have also been in poor health, but we were always calling each other. We shared so many good, happy, and also sad times during our long-time friendship. I will miss her so much, because the pain in my heart tells me so; i feel a big void in my chest. My relief is to know that she will not be hurting of any of her pain at all. God carried her in his arms to His peaceful home, heaven. Thank you, Gloria, for being my friend always; i love you like a sister, which I never had, but you got be better than that, my sister in Christ, Amen !!! A Mom is like none other. Gloria has always been a special lady. I’m so blessed to have known her, and will always keep my memories of her in my heart. I will miss her, and never forget her. I look forward to seeing her again with our Father God in Heaven. My prayers for joy, love, peace and strength to continue for you Diane, and your entire family, in Jesus Christ name. Your Mama loves and adores you and your family so very much. Didn’t know her very well or very long, but we liked her. She was sweet.